Since the tragedy at Sandy Hook Elementary School, grants for tens of millions of taxpayer dollars have been distributed to harden the doors and windows of Connecticut schools. According the Department of Public Safety and Emergency Services, grant money has gone toward everything from new surveillance cameras to new locks to card-reading entry systems. It’s up to local school districts to decide how that money is best spent, but hundreds of schools in the state have chosen to secure their entrances and first floors with a security film meant to hold the glass together, delaying an attacker from gaining entry for minutes. The resume of Phil Santore, a security consultant and engineer with Ducibella, Venter and Santore in Hamden, includes work on the construction of the new Sandy Hook Elementary School and One World Trade Center in New York. Santore said the attack at Sandy Hook could have yielded much different results if the shooter had not gained immediate entry into school after shooting through the glass window in the lobby. “Everything is about time,” explained Santore, citing an FBI report that finds the average police response time to an active shooting event is four to six minutes. “If we can buy that four to six minute window and keep people as safe as we can, it’s likely we’ll save lives and a bad situation won’t get worse. " Newtown police responded to the shooting at Sandy Hook Elementary in about two minutes, which is the amount of time 3M Corporation's security film can hold up against an attack, according to a company representative. It’s a promise that proved good enough for many school districts in and out of the state. “In the state of Connecticut, easily over 200 schools have installed 3M safety and security films,” said Bill Pettit, 3M’s security film marketing manager. “The purpose of the 3M window film is to hold the glass in place. Once the glass is broken, all that glass stays inside the frame." 3M is one of several companies that sells the security film, which comes in different strengths, from a 6-mil film up to a 14-mil film. The durability of the product increases the higher the millimeter count. 3M has even posted videos of a simulated, real-world attack on its website, which shows an intruder shooting, then kicking and punching the glass. While many schools have used grant money to install the security film, Santore recommends the new Sandy Hook school install School Guard Glass, a retrofit pane new to the market designed to fit in quarter-inch door and window frames. This means School Guard Glass is compatible with the majority of existing schools, businesses and homes in the country. 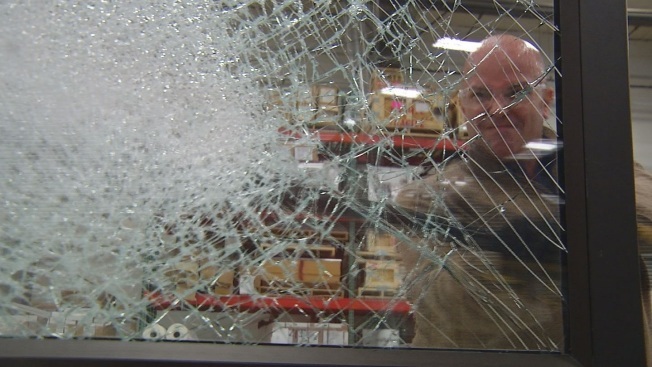 Santore traveled to Maryland on his own dime to see how School Guard Glass stands up against security film. In an independent test conducted by HP White Laboratory Inc., the product held up for more than six minutes against a simulated attack that included gunshots, baseball bat swings and hammer strikes. HP White conducted the same test on a 12-mil security film layered on quarter-inch tempered glass, manufactured by HanitaTek. Within seconds, a hole gaped large enough to fit an arm through to open a door. Jones added that the HP White findings are no surprise and that Hanita Coatins found the same results in a demo it conducted. “The film can be breached; the goal is to slow the intruder down, reaching an arm through is different than getting your entire body through. Enough concentrated energy can puncture any film,” Jones said. With a patent pending, Kapiloff and his partner, Foster Goodrich, would not disclose the secret to its durability. They added that its unexpected strength works against an unsuspecting attacker. Despite the discrepancies between the independent test and what the manufacturers promise, Santore is not critical of those schools who went ahead and installed the security film. As for the cost comparison, the owners of School Guard glass said it's about $32 per square foot to purchase and install. Several licensed installers of film said the cost to purchase and install range from $15-25 per square foot.